The Soldiers -- How Many, and Who? The Soldiers — How Many, and Who? "Federal agents hurry past a wounded officer whose legs protrude from the window of an emergency vehicle." (The Dallas Morning News, March 1, 1993) No one treats a wounded man in this way: Experiment will show the position leaves the buttocks and lower spine of the patient unsupported, and the window edge cuts off circulation to the lower legs. Why is one agent pushing down on the protruding feet? Maybe this body was thrown into the front seat of the ambulance to hide it, or the foot belongs to a dummy, not an "officer". Truth was an early casualty in the Waco incident. A number of US military combat veterans were involved in planning the raid. Of these, we have a few names: William Buford, an Army Special Forces combat veteran, Jerry Petrilli, a Marine Corps combat veteran, and Kenny King, also a Marine Corps combat veteran. (Treasury Report, pg. 37). 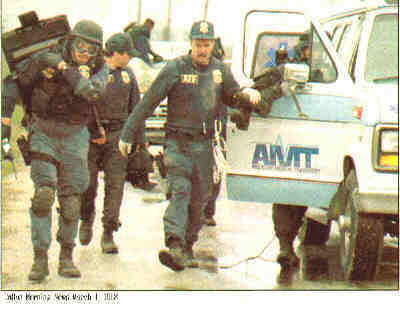 As early as July, 1992 during the Republican Administration of George Bush, BATF agents were receiving secret training for the raid. (Dallas Morning News, March 1, 1993). The site of the training and the identity of the trainers is not revealed. In mid-February, 1993, Special Forces personnel from Ft. Bragg in NC came to Ft. Hood Texas to train the BATF agents on the Military Operations Urban Training Facility (MOUT) at Ft. Hood (Treasury Report, pg. 73). (See the description of MOUT training in The Los Angeles Times, July 11, 1995). Who were the soldiers who executed the raid? The organizational affiliation of at least some of these people has not been revealed. The Treasury Report says 76 ATF agents took part in the February 28 raid (pg. 1), but contemporaneous news reports give the figure as 100. Who were the other 24 "agents?" Waco researcher and satellite engineer Ken Fawcett captured TV raw footage showing what appeared to be a TV cameraman being physically assaulted by ATF agents on the day of the raid. After Mr. Fawcett circulated the footage, it was revealed that Dan Mulloney, a camera man KWTX, the CBS affiliate in Waco, had been at the scene filming activities that morning, and was assaulted by ATF agents. Why would ATF agents "among others" physically attack a TV cameraman taking video pictures of injured ATF agents? Had Mr. Mulloney inadvertently taken footage of some Special Ops commandos at the scene? Recall from The Black Army that "Special Ops Commandos Wear Civilian Disguises" when on secret missions. Recall also from the same exhibit the level of secrecy surrounding Special Ops activities. When Green Beret combat forces were in el Salvador in 1982, a US colonel, videotaped by a TV crew carrying an M-16 rifle, was whisked out of the country before too many questions could be asked ("Lying and Secrecy — Standard Operating Procedure," in The Black Army). Did Special Ops Take an Active Role in the February 28 Raid? Even the Department of Justice (Redacted) Report in (Appendix B, pg. 8) admits that 15 active duty military personnel took part in the Waco Holocaust. Recall that Special Operations (1) conduct illegal operations (2) conduct these illegal operations in secret (3) routinely lie about their activities, and deny involvement (4) conduct these illegal operations under the ruse of training (5) conduct these illegal missions while wearing civilian clothing, and (6) are not opposed to killing civilians. The direct participation of Special Ops commandos in the February 28, 1993 raid should be considered an open question by all fair minded persons.